Illinois State University broke freshmen enrollment records for the third year in a row. 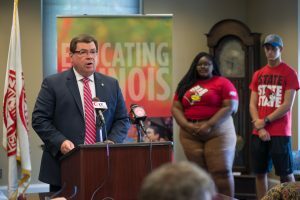 You may have already heard about Illinois State University’s record-breaking enrollment numbers for the third year in a row, but there’s more to know about this class of Redbirds and why they chose Illinois State. This year’s freshman class boasts an impressive 217 students with an ACT score of 30 or higher, 3 percent more than last year. Many of these students will participate in our Honors Program, which saw a 52 percent increase in enrollment this fall, making this Illinois State’s largest Honors class ever. Illinois State is committed to creating an increasingly diverse and inclusive learning environment, and that starts with our student body. Roughly 28 percent of our fall 2016 freshmen come from underrepresented backgrounds. We welcomed 9 percent more Hispanic students and 10 percent more African-American students in our freshman class than one year ago. 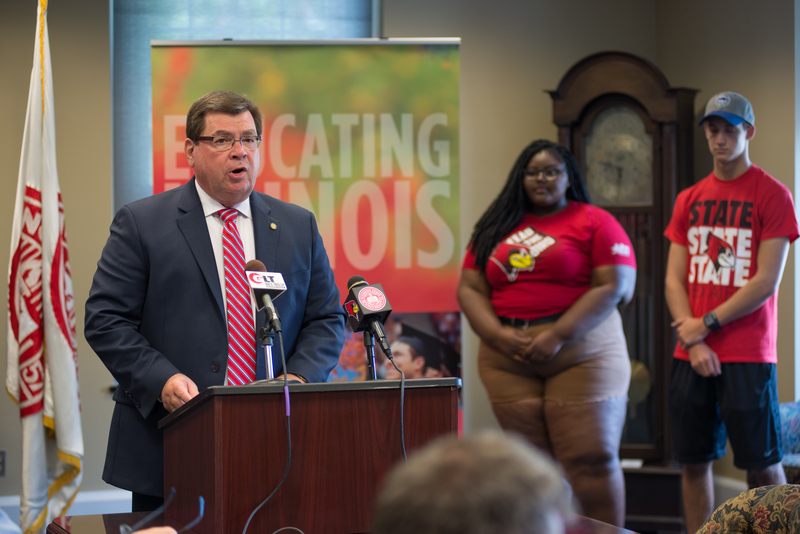 President Dietz talks about Illinois State’s enrollment during a September 6, 2016, press conference. At right are new freshmen Kharisma Thomas and Ben Henson. More transfer students are choosing Illinois State too. Illinois State was already the No. 1 destination for transfer students in Illinois, and the number of incoming transfer students increased by 2 percent again this year. What’s more, we’re one of only 40 schools across the country to be named to Phi Theta Kappa’s inaugural Excellence in Community College Transfer Honor Roll. 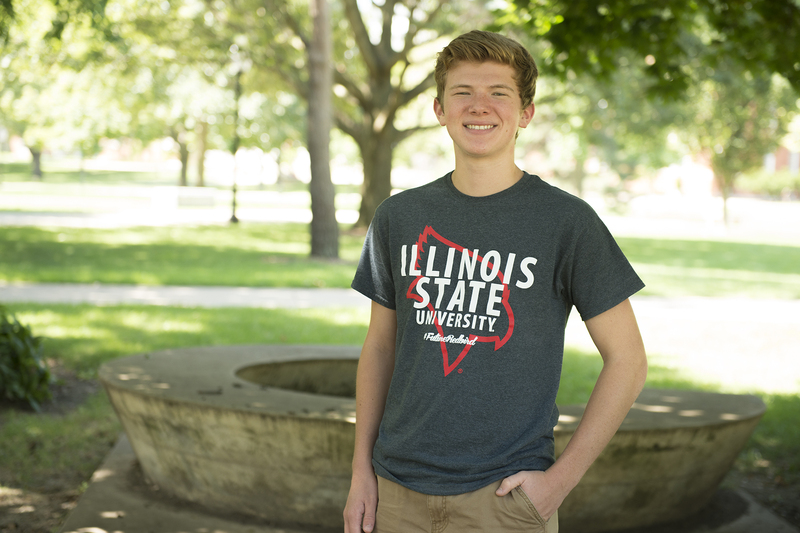 Illinois State works with students to make their college experience an affordable one. In fact, all 2016 freshmen with a 25 ACT (or equivalent SAT) and a 3.4 GPA received merit-based scholarships, and more scholarships were awarded to freshmen and transfer students than ever before. 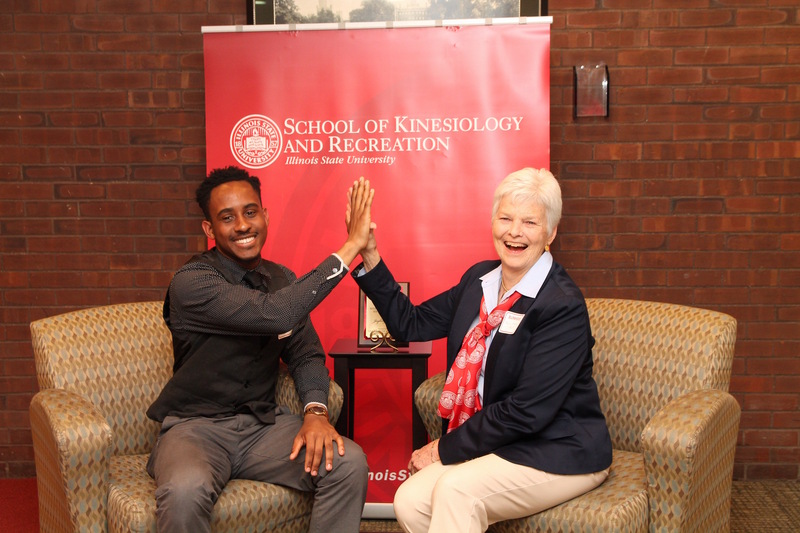 Retired School of Kinesiology and Recreation faculty member and former women’s track and field coach Joyce Morton Kief and her scholarship recipient, Jaylon Joyner, high-five during the awards ceremony April 22, 2016. More than 82 percent of our students receive financial aid to make their Illinois State dream a reality. Our Financial Aid staff is committed to assisting students and their families, from questions about the cost of attendance, to filing a FAFSA, to applying for grants. Our low student loan default rate, coupled with our high graduation rate and alumni earning power, put us in elite company on the U.S. Department of Education’s College Scorecard. Illinois State is a popular destination for students within the U.S., but it also serves as a home away from home for international students. This fall, we have 168 new international students on campus, up 14 percent from last year. Freshman Griffin Megeff accomplished something remarkable—and then he did it again. Griffin earned not one, but two perfect scores of 36 on the ACT! As a result, he had his pick of colleges to attend. In the end, because he knew we could provide him with a great education, opportunities to explore his passion for music, and an academically challenging Honors Program, Griffin followed his sisters’ footsteps and became a Redbird. Illinois State University freshman Griffin Megeff. Many students from this year’s freshman class are the first in their family to attend college. Just like new Redbird Enrique Rocha, many first-generation students are striving to make their families and friends proud. 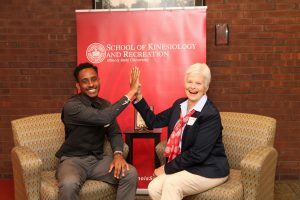 Thankfully, Illinois State faculty and staff are dedicated to helping first-generation students successfully transition to and succeed in college through programs like Redbird Ready, and academic resources such as advising, tutoring, and workshops through University College. For the 10th year in a row, Illinois State received over 13,000 applications for fall admission. While we can’t admit every student who applies, we’re thankful for the multitude of prospective students interested in calling Illinois State their new home. Students from all over the country flock to Illinois State—from 43 states, to be exact. One reason why our out-of-state population is growing is that students from bordering states and academically talented students from across the country receive the same rate of tuition as Illinois residents. Now that you’ve learned all about this year’s new class, consider joining our Redbird family. Illinois State remains strong and steady, and now is the perfect time to apply or schedule your visit.